Opinion (William Blum, American author, historian, and critic of US foreign policy): “The historian who chronicles the US Empire, William Blum, issued his 130th Anti-Empire Report this week. In it he notes that the US, by far, is seen by the people of the world as “the greatest threat to peace in the world today” with 24% taking that view. Only 2% see Russia as such a threat, and 6% see China. My Comment: Undoubtedly, eventually we will become more inclined to the same opinion, feeling unprincipled American pressure on ourselves. Everything went smoothly until the US got to Israel, but their opposition to Israel will mark the beginning of their end. After all, Israel has a mission in the world: to bring the world to unified good connection and thus raise it to the next level of existence. Israel is only now beginning to implement this mission. Replacing Israel at such a time is help toward detriment; the US is pushing itself to an endless fall. Question: When we are talking with people, they agree that the whole problem is lack of unity and lack of connection. But they don’t believe that it is possible to attain connection and reach peace. What can be done with this remarkable lack of faith? Answer: Everything is attained in the form of “from your deeds we shall know you.” If during a discussion in a circle, a feeling of warmth, closeness, a new feeling that was never felt before, is awakened, then we see a new force being born here. So why can’t it warm the person at least for a few hours or days, obliging him to relate differently to other people, to the reality that surrounds him? This is called, “from your deeds we shall know you.” The Creator shows us his presence, even though in the meantime this is concealed and limited. But we already feel that He exists within our circle: born and revealed. People don’t believe that this is possible, whereas we prove this is possible by moving them through these feelings. Come, let’s make an exercise and prove with this how this force begins to act. It must be like a laboratory experiment leading to this discovery. That is how every scientific discovery is achieved. Before, this phenomenon was unknown to us, and now we discover that it is known, and thus we see it. With the help of a unique instrument called a “circle,” we discover a new phenomenon in nature. And if we use this new force correctly, then we can succeed in everything, correct everything. This is to the way that electrical power was discovered: First they discovered that amber can be electro-statically charged by rubbing it with wool, and then small objects would be attracted to it. But look at what kind of results we have reached through rubbing some amber? Electricity is around us everywhere now. Such advancement was attained through the discovery of a force that a few hundred years ago was unknown, and after that we began to work with it. Today, it is already impossible to live without electricity. But we don’t see this force itself, rather only the results of its activity. The same thing happens with the Creator. Don’t call this force “Creator” if it confuses you. This is simply a force that appears within the connection between people. This is called a true Creator (Boreh), meaning Bo ve Reh (come and see). As with electricity, there is no mysticism in this. The Creator is concealed like electricity, nothing more. The difference is only in that to discover the force of the Creator, the emotional participation of the person is required. In the meantime we can become emotional only about troubles, negative pressure, and through force. So let’s invite positive emotions into us. If one evening the entire nation were to sit in unification circles, then we could create such a power station for the higher power, that tomorrow all of life would be different. Come, let’s try it! We would have such an intense power station like one that gives electricity. Through this force we could change the whole world: We would turn on the light all over the world. This is in our power, in our hands, and we don’t have the right not to use possibilities like this. This succeeded with Abraham, also with Moses, so why wouldn’t it succeed with us? It is said, “When will my deeds reach the level of the deeds of my ancestors?” Well, then, we simply need to realize it. Question: Will the military operation in Gaza to stop the firing at Israel help? We always start this operation but never bring it to the end. Maybe now it is finally time to complete it? Answer: When I came to Israel more than forty years ago, there was a popular song, “I promise you, my little girl, it is the last war.” I even then thought of it as naive. Don’t the people understand what the last war is? There has never been such war in human history; we still need to reach it. The last war is the one that we conclude with the perfect state. But is it possible to achieve perfection by destructive military actions? Everyone knows that a military operation cannot lead to peace. Besides that, the opponent has to justify his own death. They are ready to die, and even wish to do so! They bless death. A mother doesn’t cry about a killed son! Because she believes that he immediately goes to heaven. Is it possible to fight against such an ideology and achieve success by military action? As a result, we spend a lot of money, are nervous, many more people will leave the country, and nothing will change. Everything will remain until the next time, which could be very soon. We are standing not against an external enemy, but against our internal one. All these terrorist organizations are not our true enemies, but are only puppets. It is said: “The hearts of ministers and kings are in the hands of the Creator.” It is us who activate those terrorists by our good or bad actions. Question: How can we switch from the external enemy to the internal one? The external enemy is clear: There is a list of terrorists; the organization that manages them is known. Answer: It is not limited to only Hamas. In Iraq, there are terrorist organizations much worse than Hamas that are waiting for their turn to wage war against us. In general, the entire world is against us: Look at what is happening in Europe, in America. It is clear there is a global problem that we are in the center of, and we need to solve it. The science of Kabbalah talks about the structure of the world and explains why this is so. Humanity in its development must achieve a certain form, and it can only reach it under the condition that the people of Israel will take it upon itself to be a leader in the process of correction. But it does not want to be a leader and escapes this. It wants to be like all other nations, but it is not allowed to live this way. It is naïve to believe that we can achieve something through external actions. Against whom are we fighting? We are approaching a state where we will have not a single ally. Europe and Russia no longer support us, and more recently, America has ceased to support us. We will be left alone, without allies. Through the upper mercy, we are allowed to hold out for some time, but that’s all. So, it is impossible to continue if we do not switch to the true path along which we will go towards correction, not trying to win by our own forces, but by using the forces of nature and their correct arrangement. The wisdom of Kabbalah has been talking about this for a long time. Baal HaSulam started shouting about this even a hundred years ago, warning of the dangers of World War II and the Holocaust. But nobody listened. I hope that at last we will be listened to. Can A Person Alone Expect Success? Question: Why is it so important to study Kabbalah specifically in a group and not at home alone? Answer: This option is possible. You can get on the Internet and receive all of the information; the entire archive is open to you filled with video, audio, and text files. Certainly you can sit at home and study Kabbalah by yourself, but how will you realize it in practice? If a person wants to become an expert, he must go through practical experience. Imagine a chef who learns how to prepare dishes by the books, but never sees a cucumber or tomato and so forth. What kind of chef would he be? How can you implement the wisdom of Kabbalah on your own? Nothing will result. You must realize it in a group with friends because only through the right connection between you will you begin to feel what is written in the books. Certainly you can study at home, but you won’t get anywhere from this at all because you will not know what you are studying. There are friends who study at home and don’t even want to come to conventions to meet with other people. They think that it is enough for them just to study. What can one say to them? They don’t realize their lessons at all. They don’t feel the material; they don’t discover the same world about which they are reading. I could say much about this, but a person must understand that the wisdom of Kabbalah is grasped only in a group. All of the Kabbalists write about it. If a person comes to us for lessons and opens Kabbalistic source books, in all of them they talk about it. But he doesn’t read them because he is too lazy. He doesn’t want this because then he would have to work against his ego: come to a group, take part together in events, be involved with dissemination, and so forth. So people like these leave us, and with this their Kabbalistic development ends. Every new day is a new level of our development; days don’t just go by one after another. We see at what speed things are changing in our time; the whole world is changing. It could be that people still don’t understand this and are not paying attention, yet immense changes are happening in the world: leadership is changing and passing from the hands of the rulers to the hands of the people. The government and other power structures are trying to control through mass media that have become international channels of communication, yet the higher power is working through the people so that from here on they will declare their state, their decisions, their opinions, and all regulations by themselves. The world of today is passing through revolutionary changes. Even wars are different: instead of murder and destruction, war is directed towards the molding of social opinion; the opinion of the people determines the success of the war. This means that the war bears a completely different character unlike what it was previously. We win not by means of military power but by the power of influencing the hearts and minds of human beings. This is a real weapon. And we are prepared to participate in this war because we have the most enormous power in our possession. So it is impossible to think erroneously that we are dealing with a tangible, physical enemy. Our enemy is the degree of concealment within us. And this is not even an enemy; rather it is a “helpmate against us” so that we will correct our perception until we feel that a higher plan is at work in everything. And this perception must extend among all who belong to the process of correction, meaning among all the people of Israel who are found in the land of Israel. This is our true weapon in this war. This doesn’t mean that people will just hear about the wisdom of Kabbalah, rather they will know what is happening with them. This is important both for the people of Israel and for its neighbors and the whole world. Only in this way can we attain the appropriate result, which is to bring all of humanity closer to the Creator. This is the only true reason for everything that is happening, both in general in our lives and in particular in a situation that is so unique as it is today. There must be no delay; we must convey this information to the people of Israel and to the whole world in the most direct and open form, without any limits. All of humanity is passing through this new war now in which different perceptions are at war, all kinds of outlooks and beliefs. Ideologies are fighting each other, not tanks. You cannot attain anything anymore simply by means of a simple weapon. Information and the struggle over broad views are becoming a weapon. And behind all of this stands the Creator who is trying to bring all of creation to Him. So He is causing a conflict between our opinions, arousing ideological wars so that we will scrutinize how to approach correction. I would like to thank you for keeping your promise to come to us. When I traveled to this meeting, my heart was filled with love and warmth, as if you were a person close to me. Answer: Of course, we are close since we are from the same area of Reshimot (spiritual genes). So they were revealed together since we arranged a connection between us in this world. Therefore, we all found each other in the same time and space. It is amazing! I have a student, who, when I saw him the first time, I was amazed at how he looked at me with deep contempt, with such a look of hatred. That was a few years ago. Today, I look at him and he’s a completely different person. This indicates that the Reshimot under the influence of the Light determines all of our behavior and all that happens to us. You can’t imagine what kind of influence these summer months of dissemination to the general public will have. It isn’t important how they are conducted. External success doesn’t imply anything or shouldn’t cause any disappointment. However, the efforts that you invest, both corporeal and spiritual, go toward the calculations of the Masach (screen). Therefore, you need to appreciate that the Creator gave you this opportunity, even though He brings you through great difficulties in this decision. However, in any case, He chose you. Question: Our life is a continuous chain of events, encounters, and situations, a series of questions that require answers. A special sense that could allow us to tell the difference between good and bad, between what is beneficial and what is harmful, would be very helpful in order to prevent our stumbling and making sure that we advance in the right direction. We surely would teach children this skill because, if they could tell the difference between good and bad, they wouldn’t go off-track and could fulfill their life efficiently. Good intentions very often lead us into trouble, and sometimes a person pays for a mistake that he makes with his success, and sometimes his mistake can help him in some way. However, we don’t need mistakes; we need a method that will allow us to constantly keep going in the right direction. How can we create such a compass that will indicate the right direction in every situation? How can we understand what is good and always aspire for it? Answer: Indeed, at first, I don’t even know what is good and what is bad. A child wants many things, but he only receives some of them from his parents. Sometimes, they tell him, “No, this isn’t good for you. It will harm you.” This is how he learns what is bad. In addition to that, he learns what is good, although he often may not like what is good. “Be a good boy, listen and learn, and help.” Sometimes, the actual term, “a good boy,” deters the one it is intended for. Therefore, we eventually should distinguish between what is good and what is bad. For some reason these terms are not absolute. In our world, there are no universal labels that indicate the variety of shades between these two opposites, and so everything depends on education. In different societies, nations, and cultures, there are generally accepted conventions as to what is good and what is bad. But, at the same time, there are still disputes in every nation as to what is good. So, eventually, there are only vague definitions that lend themselves to many interpretations. On the other hand, the moment a person approves something and decides that something is good, it is very hard to convince him and to explain to him that good is a totally different thing. These criteria depend on our innate attributes, on our parents, on education, on our friends, and so on. It is always painful to change our values and our perception as to what is good and bad. Therefore, we need criteria that are above all the conventions and the doubts, criteria that are independent of a political platform, economic situation, social status, and so forth. We need a perception of what is good and bad that is above humanity, above any doubt. Only then, if I listen, see, and understand that it is so, I can adapt my life and my actions to this perception. It turns out that the axiom as to what is good and bad for humanity must be written in Heaven, and, then, accordingly, we will begin to clarify how to distinguish between good and bad in different variations and aspects. When there is a great difference, we can solve the problem easily since we can all see the contrast. However, when it comes to fine points that not everyone can see, we must educate people and teach them to feel what is good and what is bad. Thus, they will be able to distinguish between the shades and nuances, and find the right solutions. Everyone can develop the talent to do so. The tree of knowledge symbolizes this ability. In fact, this tree encompasses the whole world and our whole life. Question: Where can we acquire this talent? Answer: Who actually needs it? Who recognizes the need for it? Unless humanity, like a stubborn donkey, hits its head against a wall and realizes that there is nowhere to advance and that darkness is coming, it will not listen and seize the opportunity to develop the sense for good and bad. Baal HaSulam, “The Arvut” (Mutual Guarantee): Thus, because of the above necessity, the Torah was given specifically to the Israeli nation, solely to the descendants of Abraham, Isaac, and Jacob. This refers to the souls that can be awakened by the Light that was in the state called Babylon. First, the force called Abraham awakens inside Malchut, and then the evolution and the development of that soul is called Isaac and Jacob. This is only about spiritual systems and parts of the desire to receive, not about historical figures that are the external expressions of phenomena that take place inside the general Malchut. In order to understand these phenomena, we must look a bit more deeply into how Malchut is awakening to correction. The system of first man was shattered, then it was stabilized in a certain state, and now it should begin to correct itself from a state called Babylon. The ego develops as a result of a special Light called the Surrounding Light (Ohr Makif). There are parts of the desire that descend as a result of a greater Light, and that means that the ego grows, building of the tower of Babel. There are other parts of the desire that yearn upward as a result of the same Light. …For it was inconceivable that any stranger would take part in it. Because of that, the Israeli nation had been constructed as a sort of gateway by which the sparks of purity would shine upon the whole of the human race the world over. The same people, the same souls, the same parts of the desire, have become GE (Galgalta ve Enyaim) with regard to the lower part of Malchut that did not manage to wake up, and are called AHP. This is how the passage of the Light through GE to the vessels of AHP was created. This means that it isn’t enough that only the souls of Israel that came out of Babylon and ascended upward should correct themselves and observe the Mitzva (commandment) of love thy friend. They must be connected with at least part of the other souls, which means that they went down to Egypt. It is from Egypt that they take out the vessels of AHP of GE. The desires of GE, called the patriarchs. Abraham, Isaac, and Jacob, came out of Babylon, and then they received AHP from Egypt and came out with them, are mixed with them, and are shattered. That is, there is the destruction of the first Temple, the shattering of GE together with AHP. Then, they are ready to be mixed with the rest of the desires of Babylon and reach correction. At the end of correction, we also correct the vessels of GE first, and then AHP. However, here, the stages are different. When the vessels of GE correct themselves, the Light is poured through them unto the nations of the world and begins to bring them closer to GE. So, the more that the vessels of GE correct themselves, the more AHP is corrected. We are in the phase of the end of correction now. 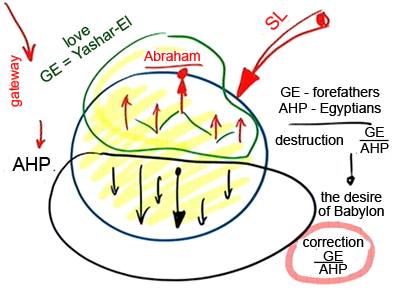 We already have been through the destruction of the temple, have been mixed with the vessels of Babylon, and the only thing left now is to correct the desires of GE, and, through that, AHP will be corrected. We will feel that the Light is spreading through us and the entire world begins to behave differently. It will be a real miracle when all this happens.